So you should have ValidateThis installed. 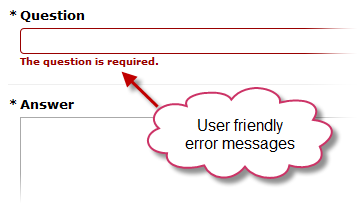 Today we'll configure a simple form for a FAQ and add some validation rules. Before we add our form we'll setup some things for ValidateThis. First we'll add the necessary jQuery libraries. There are various ways to do this but here I'm using the new Asset Manager component in Model-Glue to load my .js files. Next we need to setup our ValidateThis service. getInitializationScript() is going to setup our client side jQuery for us - here I'm telling it not to include the requires jQuery libraries as I'm managing that manually. In the latest ValidateThis you don't even have to install jQuery - it can pull the necessary files from a CDN. getValidationScript() will actually look at our rules file and create the specific jQuery validation rules for our form. 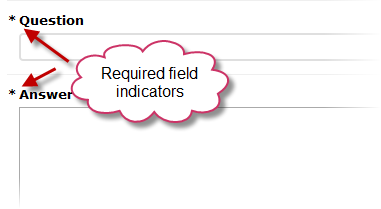 Finally we can get a list of required fields from our rules file. Here I am passing in my object type so ValidateThis knows what rules to apply. I'm using the excellent cfUniform library for my forms. Below we setup our form, and you can see I'm passing in my the "requiredFields" we defined earlier. cfUniform will use this to flag the fields as required with an asterisk. Below is my simple form. You'll notice there is no markup for validation rules! In the next post we will look at server side validations and adding some additional constraints to our rules file. We'll also explore the power of 'contexts' which allow you greater control over what gets validated and when.